With the advancement of the technology biometric systems became more advance for Digital Security, until now probably you have heard about the fingerprint recognition in which the requirement was to touch the device and you are authenticated. But latest approaches shows that we could have a finger scanner with no-touch activity, NIST (National Institute of Standards and Technology) has just start funding a number of startup companies to develop a touchless finger recognition system. In contactless Biometric security persons presence is needed but from meters away. 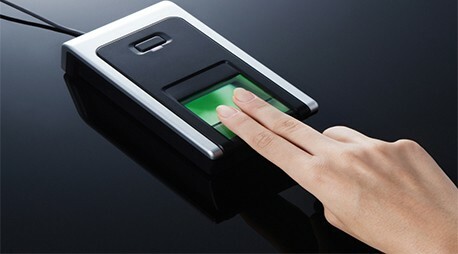 Special Fingerprint scanners have already been used by Samsung and Apple in their smartphones to authenticate users and in near future fingerprint scanners are believed to be the part of many other locked devices that could be unlocked using fingerprints, just to add an extra layer of authentication fingerprint scanners are used to authenticate between two fingers. Fingerprint sensors are one of the mostly used identification system in biometric technology or in access control technology. Fingerprints requires the comparison of print patterns, the patterns include minutia points, and are aggregate characteristics of ridge, and they are the unique features present in patterns. To employ successfully imaging technology for fingerprint scanners we also need to know about the skin properties and pattern of the skin.